OregaResp is the strongest of all the wild spice formulas. It contains desiccated pure spice oil. It is a synergistic blend, which gives it extra power. This is the power of desiccated pure spice oils of wild oregano, wild sage, remote-source cumin and cinnamon. This is the perfect combination of spices to provide maximum power where needed. These spices grow wild in the mountains of the Mediterranean, far from the pollution so common in most areas of the world. Plus, they are free of chemicals, pesticides, herbicides, and are non irradiated. Untouched by man, the wild oregano and wild sage are allowed to grow under natural conditions in rich soil, with negative ions from the sea and sun-drenched land. The sun produces large amounts of electrically charged ions, which increases the spices’ potency. Only OregaResp guarantees sun-enhanced, deep Mediterranean spice oils. OregaResp capsules have undergone a unique process to be classified as our most potent formula: of low temperature desiccation. This state-of-the-art technique of drying concentrates the oils so much that one capsule is equivalent to fifty drops of oregano oil. Now that’s powerful! The benefits of oregano oil are well established. In order to maximize the benefits of using OregaResp, we use only the P73 blend of oregano, the highest quality oregano known to man. This P73 wild oregano is truly a unique variety, which stands out among the many types of oregano. Although P73 Oregano is already powerful, we further complement this formula with cumin, sage, and cinnamon oil powders. Oregano, cumin, sage, and cinnamon are potent antioxidants—far more powerful than berries or greens. Wild sage has powerful properties written about throughout history for its benefit to the body and soul. Sage is a powerful fat-soluble antioxidant, and cumin’s antioxidant powers are also well-established. Finally, wonderfully fragrant cinnamon is added to the formula. Only high-grade cinnamon made from the edible bark is used, which has been super critically extracted to ensure the highest potency. OregaResp is also available in an oil form and an easy-to-take gelcap, which is ideal for young children and those who do not need the power of the dry capsule. This is the raw oils of OregaResp emulsified in an extra virgin olive oil base. Many find the greatest benefit from simultaneously taking the oil and the capsules. This synergistic blend is truly rare, not only for the quality of oils but also for the one-of-a-kind blend of spice oils. Take one or two OregaResp capsules daily. For a larger dose take two capsules three times daily. Children can take OregaResp softgels, once per day. It is even safe for pets—just open a capsule and dust onto their food. 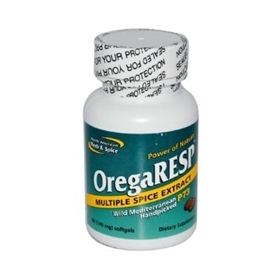 OregaRESP P73 – 60 softgels are the only multiple spice extract made with handpicked spices from remote mountain regions. OregaRESP P73 – 60 softgels contain P73 wild oregano, high-mountain sage, and cumin, with concentrated CO2-extracted cinnamon and ginger. These powerful oils are then naturally converted to a concentrated powder before being encapsulated. This revolutionary process creates a highly concentrated herbal blend in a small capsule. Each capsule of OregaRESP is equivalent to 50 drops of the oil! Take one or more capsules twice daily. Increase as needed.